Beryl var. emerald specimen with host rock, showing clear hexagonal structure. Beryl is a mineral with the chemical name beryllium aluminum cyclosilicate (chemical formula Be3Al2(SiO3)6). It has a vitreous (glassy) luster and can be transparent or translucent. Pure beryl is colorless, but it is frequently tinted by the presence of impurities. Possible colors are green, blue, yellow, red, and white. The name "beryl" comes from the Greek word beryllos, referring to the "precious blue-green color of sea water." Several varieties of beryl are valuable gemstones, such as emerald and aquamarine. Beryl has a hexagonal crystalline structure and exhibits conchoidal fracture. The crystals may range in size from very small up to several meters in width. This mineral has a hardness of 7.5-8, and its specific gravity (density relative to that of pure water) is 2.63-2.80. Varieties of beryl have been considered gemstones since prehistoric times. Green beryl is called emerald; red beryl is bixbite, red emerald, or scarlet emerald; blue beryl is aquamarine; pink beryl is morganite; white beryl is goshenite; and a clear, bright yellow beryl is called golden beryl. Other shades, such as yellow-green for heliodor and honey yellow are also common. Red beryl is extremely rare and is not used in jewelry as it forms tiny crystals. Blue beryl (aquamarine) fades in color when exposed to sunlight. Beryl is found most commonly in granitic pegmatites, but it also occurs in mica schists in the Ural Mountains and is often associated with tin and tungsten orebodies. 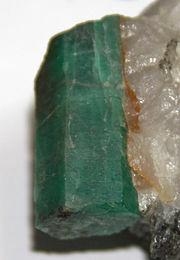 Beryl is found in certain European countries such as Austria, Germany, and Ireland. It (especially morganite) is also found in Madagascar. The most famous source of emeralds in the world is at Muzo and Chivor, Boyacá, Colombia, where they make a unique appearance in limestone. Emeralds are also found in the Transvaal, South Africa; Minas Gerais, Brazil; and near Mursinka in the Ural mountains. In the United States, emeralds are found in North Carolina. New England's pegmatites have produced some of the largest beryls known, including a massive crystal with dimensions 5.5 m by 1.2 m (18 ft by 4 ft) with a mass of around 18 metric tons. Other beryl locations include South Dakota, Colorado, Utah, Idaho, and California. Massive beryl is a primary ore of the metal beryllium. In addition, as noted above, several varieties are valued as gemstones. Recognizing the beauty of beryl, a biblical passage (Ezekiel 1:16) describes the wheels of God's throne as having the appearance of "gleaming beryl." The earliest crystal balls were made from beryl, later being replaced by rock crystal. The druids (the priestly class in ancient Celtic societies) used beryl for scrying (crystal gazing). Beryl var. aquamarine, from Brazil. Morganite, Aquamarine, Heliodor (Golden Beryl). This page was last modified on 3 June 2016, at 16:38.